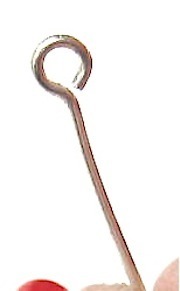 Eye pins hold many pieces of glass beaded jewelry as well as fused glass jewelry together. They are used widely in earrings,bracelets and necklaces. You can buy them ready made or make your own. They are easy to make, follow the pictures below and practice on some scrap wire; you will soon master it. 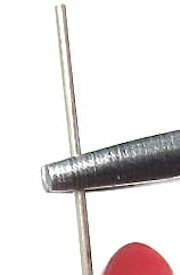 20-22 gauge wire is usually the size to use for making these pins. 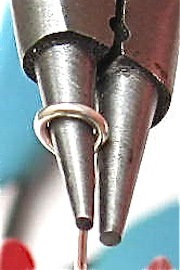 For earring connectors you may wish to use a lighter gauge. Just follow the stages below to complete a pin. Take a straight piece of wire and, using either your chain nose or flat jaw pliers bend the wire to form a right angle. You should now have a nicely formed bend as per the photo. Switch to your round jaw pliers, decide how big you want the loop and grasp the wire at that point. Just gently roll your wrist around so that the short piece of wire begins to form the loop. When you have formed the loop use your side cutters to cut off the extra wire. 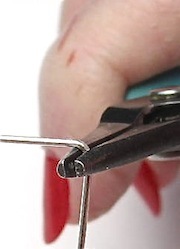 Still holding the loop in your pliers and carefully rolling the pliers, gently push up on the back of the loop with your index finger to create a nice angle on the loop as per the photo.